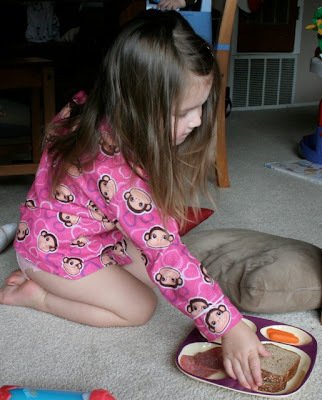 If you were almost three, up sick the whole night before and it was pouring rain outside the next day, what would you do? 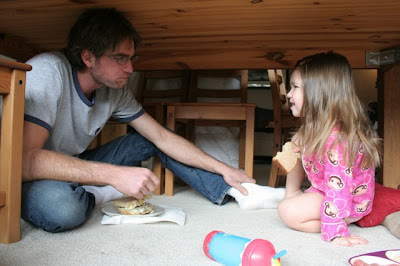 Have a picnic under the table with your dad of course! this is so cute! our kids love when we do stuff like this, out of the ordinary. If there is one thing I've learned in motherhood, its that a new toy is fun, but fun time with Dad and Mom lasts a lifetime. Aaron and I never have picnics under our table. Such a sad state of affairs. thats exactly what I would do!!! Looks great! Hope you are all better..
oh man that is so cute!!!!! just chattin away with dad. What a trooper! Markus is a tall guy to be dining under the table. Looks like your girl loved it! 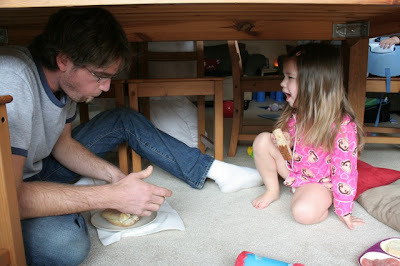 What a great daddy to play along with her under-the-table lunch idea!